Wife drove with her sister and mother to Las Vegas for a Backstreet Boys concert. (Yes, they’re still doing concerts, but may end soon apparently). She just got a flat tire about 16 miles away. Gonna park it at her sister’s house until Monday vs driving it 16 miles home and destroying the tire. America’s Tire will replace/repair as I purchased road hazard warranty from them, but they are closed until Monday. I asked “no flat tire indication from the car?” She said no. What!!! Question, how does she know it’s a flat? If she has run flats and feels/sees a flat, she’s likely already totaled the tire. If she has normal tires, the TPMS should be indicating, not to be cynical, but does she know the warning light? I ask this because my wife didn’t know what the TPMS warning light on here Lexus was, and didn’t mention it to me. Yeah that bites. On a long weekend too. I just swapped my new OZ Leggera HLT winters for my stock 5 hole summers. TPMS logged in just fine. I forgot to check the pressures before I went out to test but they all came in fine with little loss over the past few months in storage. Front left might need a bit. Good luck. 2000 Mazda Miata, "Baby Beast" Boost, mods, maybe track car. 2004 Ferrari 360 Spider, CS TCU, OZ Superleggera IIIs, "Rossina 2"
Huh? Are you saying RFTs are more susceptible to being totaled if driven low or flat? And are you saying the TPMS would not indicate for RFTs? Obviously, TPMS works the same on both tire types because it measures air pressure. 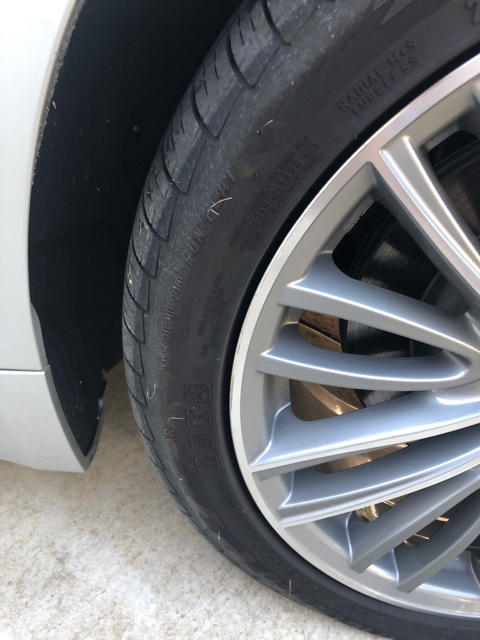 Perhaps slightly less obviously, a RFT helps the tire retain shape and stay on the rim when low or flat, both of which greatly reduce structural damage. A low or flat conventional tire which is driven on is almost certain to be damaged, whereas a RFT has a much better chance of survival. 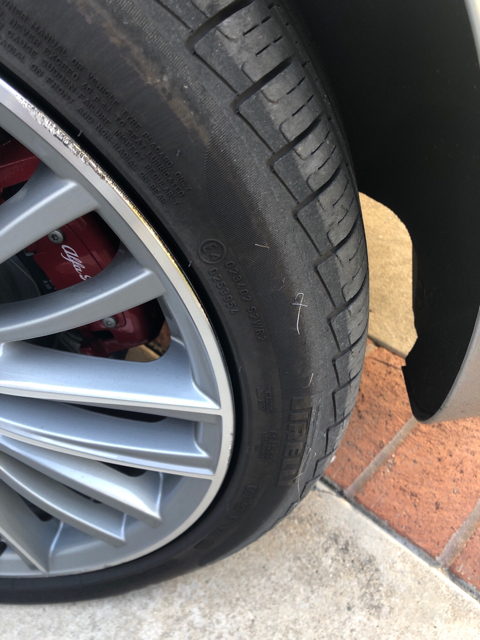 I recently slammed a pothole on the highway with my P7s which, surprisingly, survived 14 miles post-impact at high speed before letting loose through a sidewall pinch-cut right between the rim protector bulge and rim lip. I heard the hissing (as I was doing about 90mph) and the TPMS warning illuminated. I coasted down and pulled off at an exit just 300m ahead, inspected the tire, got back on the highway and made a 6 mi drive to the nearest town with the cruise control on 50mph. I strongly suspect none of that would have been possible on a conventional tire; the impact would have either cut through the non-reinforced sidewall immediately or popped the bead (RFT wheels have special bead shaping for gtreater retention), stopping me in my tracks right there. And of course, driving on a flat conventional is impossible, so the whole post-impact part of my story could not have happened at all. 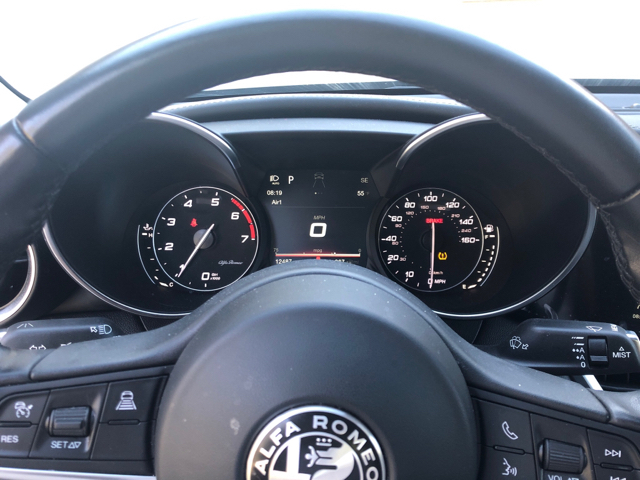 Alfa, I’m not sure she knows what the indicator warning looks like. 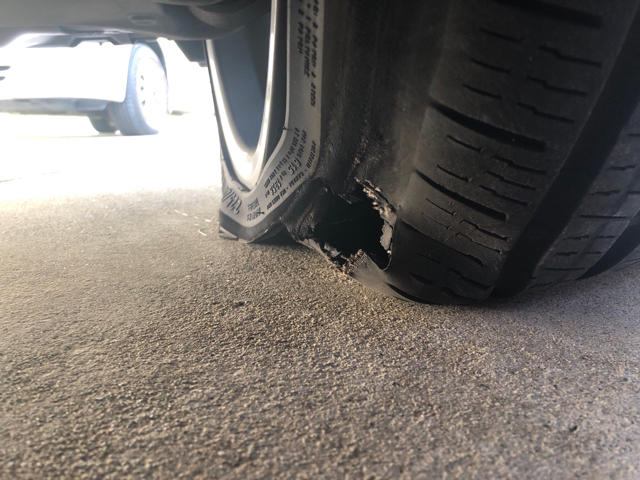 Seems like it was a slow leak and eventually while at a nearby store (waiting for the other sister’s family to come home from Church), it went flat. Then driving a few miles, if that, to the house, they noticed something felt funny, and they first thought it was the asphalt. I had just had the car serviced on Tuesday for the V27 recall, then Wednesday morning I checked the tire pressures myself because I don’t quite trust others to do it. 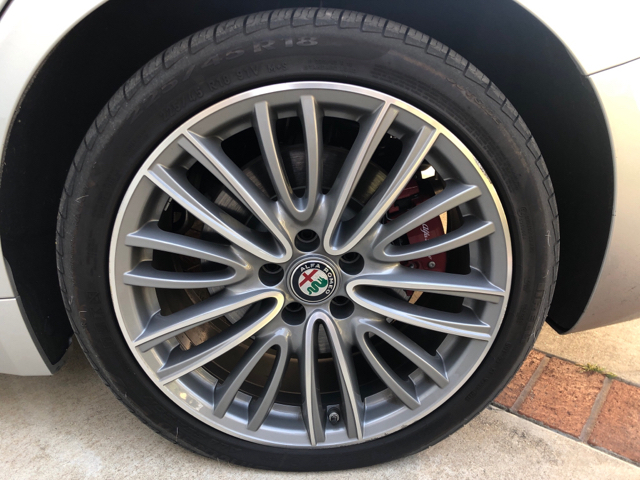 (I had made an appointment online and removed all items related to tires and brakes in the hopes they would not touch the tire pressures on their complementary inspection). The tire pressures were good. Maybe 33.0 PSI front and 36.0 PSI rear (with 0.5 PSI resolution digital gauge). Shoot! Can see the steel sticking out of the sidewall! I see the light! Tire won’t pump beyond 5 PSI with fast 12 V compressor. 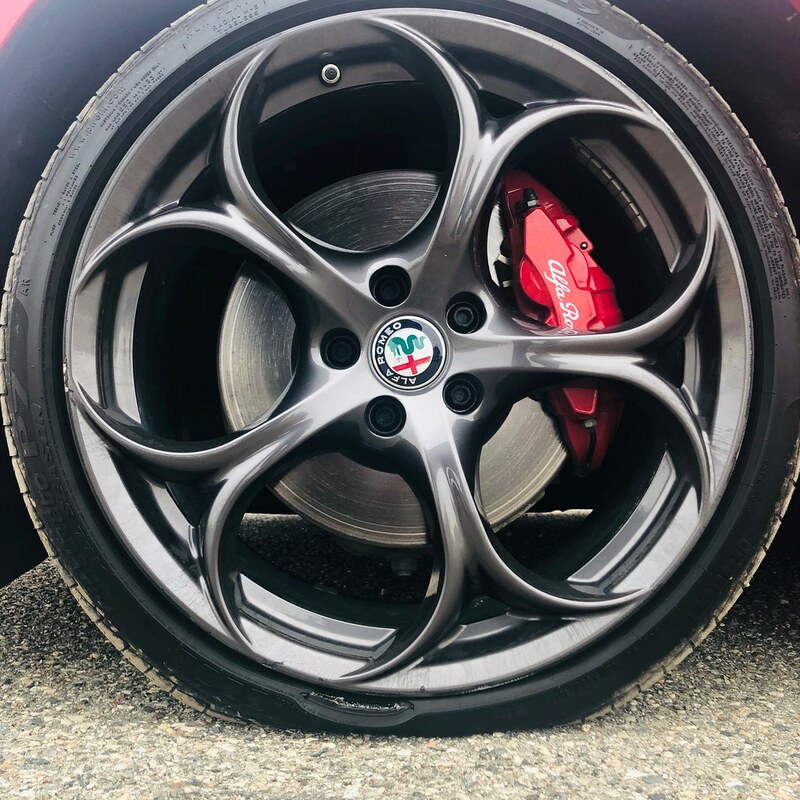 Also interesting the Lusso wheel is fitted with Pirelli; I thought Lusso got Brigestone Turanza. Last edited by chaadster; 04-14-2019 at 11:40 AM. 30 Attachment(s) Madness Go Pedal? 41 Attachment(s) In the flesh! !